We stayed with my sister in-law at her spacious new apartment in New Brighton. Our kids hung with her kids and her place was very conducive to relaxing and serious down time. I cherish time with her because of all of our shared past memories, but also out of love for her and her girls. She has the formidable task of raising two teenage girls and through talking to her over this break it's clear she's working on doing the best she can. She's focused on being there for them and moving forward after the loss of her husband, my brother. I am amazed by how healthy she looks, of her positive outlook, and am grateful our family has their family to support, love and encourage. Thanksgiving dinner was at my sister in-laws parents' house. My favorite part of family get-togethers is floating from conversation to conversation. When you tire from one, you excuse yourself and go to another. I covered everything from dinner conversation about a book on Writing Diction, to discussing how the annual thanksgiving football game was really the Dallas Corporation versus the Oakland Corporation, to pictures of harvested deer and bear and a couple dozen other subjects in-between. It is like watching a combination of the evening news, Ripley's Believe It Or Not, Big Brother, America's Got Talent and a dash of Jerry Springer all rolled into one. Because my son has only one male cousin in the area, I managed to see my oldest brother for a good spell on Friday. We took the boys out for some archery practice in the back yard and I managed to definitively kill his fence with three arrows, completely missing the target. It was a blatant reminder as to why I don't hunt. I shoot like a cross-eyed pirate. We had some good laughs, but after the third one I think my archery ineptitude was wearing on Tom, so we quit. He and I also had time to stop for a beer at the HammerHeart Taproom in Lino Lakes. It was a strange experience in some ways, mostly due to the foreboding music. (Picture Nordic-Goth-Rock). The beer was outstanding, but I told Tom that if I stayed and listened to the music for more than 20 minutes I'd likely shoot myself. He countered with if "If you stayed for two hours, you'd want to shoot everyone." That is what I like most about being around him, his sense of humor is wicked-funny. I'm always glad when I take some time to visit with him and his wife and kids. Saturday brought the bridal shower for my niece. I dropped the ladies off in Inver Grove Heights and from what I heard later, the event was a great success. I am so fortunate to have such a tight family - including the spouses of us boys, labeled the "outlaws". My wife, Mom, Sisters in-law and nieces made such an effort to make Stephanie's day special that it warmed my heart. After the shower, we all met up at a local tavern in St. Paul, the Spot Bar, touted as the first bar in Minnesota. It's a tradition of the brothers to go there on the day after Thanksgiving to watch the high school championship - often times it's my alma mater Cretin Derham Hall - but this year they bowed out early. When the ladies heard about it they wanted to join us. I got to sit and have pizza and talk with my brother and nephew for a couple of hours. You can't put a price on that kind of face time - especially given the distance we are from my family. 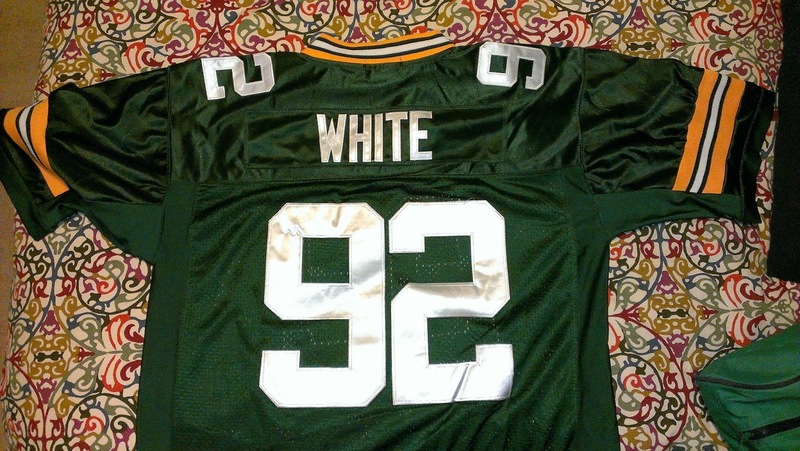 When he arrived, my nephew/godson surprised me with a Reggie White authentic NFL Packers jersey, "just because". It wasn't really a birthday present, he just wanted to thank me for all I've done for him over the years. I was touched. Later that night I had great conversations with my sister and nephew. It was clear that there was a deep appreciation and respect for me, one only matched by my respect for them. Feelings came to the surface that don't usually in the short-time family gatherings. I felt loved by all the family and friends there and it was clear the feelings were mutual. I wish every weekend gave us the appreciation for one another that a holiday brings out. The weekend was finished out with breakfast with Mom. We stopped on Sunday for breakfast, conversation and a bit of computer repair. Again, quality one-on-one time that I'm glad we took the time to do. She appreciated the computer help, but I saw it more as a chance to catch up on life. Because that's what the holidays are made for.